Where: Algarve to Lisbon, Portugal. Start Time: Depends upon pick-up location. Don’t Miss: The incredible architecture in the old Moorish Quarter. Spend a day exploring Portugal’s capital city on this Lisbon Tour from the Algarve! Lisbon is one of the oldest and most magnificent capitals in the world, as well as being one of southern Europe’s most popular cities. 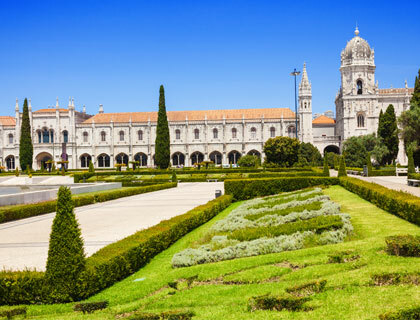 This tour uncovers some of the city’s most cherished landmarks including the Jerónimos Monastery and the beautiful Alfama area. No trip to Portugal is complete without a visit to Lisbon, so make sure you book this unmissable day trip! This day trip from the Algarve to Lisbon starts with a visit to the ‘25th April’ bridge over the river Tejo. From here you can enjoy the best views of Lisbon, before moving on to explore the city’s historic centre. Visit the Jerónimos Monastery, Torre de Belém, the Monument of Discoveries and Alfama - the beautiful old Moorish quarter. There will also be plenty of free time for lunch (not included in price), shopping and sightseeing at your own pace. Children aged 0-2 years go FREE! Shoulders and knees must be covered when entering religious buildings. Entrance fees to some venues. These may incur an additional charge. Algarve to Lisbon Tour - Full Day is rated 5.0 out of 5 by 1.